I've started working on some new box displays for my old Arcade Marquees. This time for Joust, Defender and Stargate. I still have Cliff Hanger, Star Castle, Gyruss, UN Squadron & Golden Axe too. Years ago I bought a TV stand and a Audio Video component stand from Circuit City. I don't remember what the set was called and I haven't seen it around since then. We've needed a new stand for the Audio/Video equipment in the living room, so I've decided to try and duplicate my A/V stand using my amateur woodworking skills. The Christmas break should give me plenty of time to put it together. I realized that in my videos I said the plans I'm using to create the Hyperion Gunblade would be available here, but I hadn't posted them yet. This is the main blade plan, I'll prepare and post the rest of the plans tomorrow. I use to play this game for hours with my friends. "Destroy the Boss, Only the Key Opens the Door, Open the Door!" 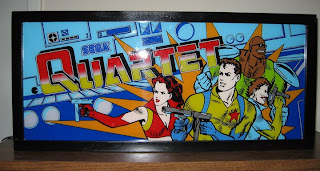 Finished a lightbox to display this old Sinistar arcade marquee. I've submitted Baccano Swing! to the Anime Los Angeles 2009 AMV Contest. Not sure when finalists will be announced, but I think the contest is the night of January 2nd. I saw the third in Jason Stathom's Transporter series of movies. I enjoyed the movie, but something about the female lead... I really couldn't stand the character. I think my inability to feel sympathetic for her made it difficult for me to get into this film. I really liked the first one, the second was good, but suffered by some bad story points in some places. The third movie had a lot of good points, although it had its fare share of weak story points. But thanks to the female lead, I'm not sure I want to see this one again. I'm not sure what the best word is for this is, but the first step is to get the video footage I'm going to use onto the computer. Nearly all of the video footage I use is from DVDs. Occasionally I'll use LaserDisc or VHS tape, but that is pretty rare. For DVDs, I start with a program called Mac the Ripper. I rip the disc in its entirety. This program removes the copy protection from the DVD's files, it doesn't reprocess or recompress the footage like Handbrake and other software does. I have used other software for DVD ripping in the past including YadeX (which is no longer supported) and OSeX (which produced results I wasn't very happy with). My video "Music" is up on YouTube. I first created this video back in 2004 for the third DDR AMV Project organized by Brad Demoss.